Week 5 picks are in. We have some impressive performances this week from our expert pickers, even though a handful of those picks were correct on razor thin margins thanks to a few near-upsets and some great games. Winners this week include Lee Corso (9-2), Kevin Carter (10-2), Brian Griese (5-1) and Colin Cowherd (8-1). However, our undisputed champion of the week is none other than Phil Steele, who blew the roof off of this thing going 15-0 on the week. 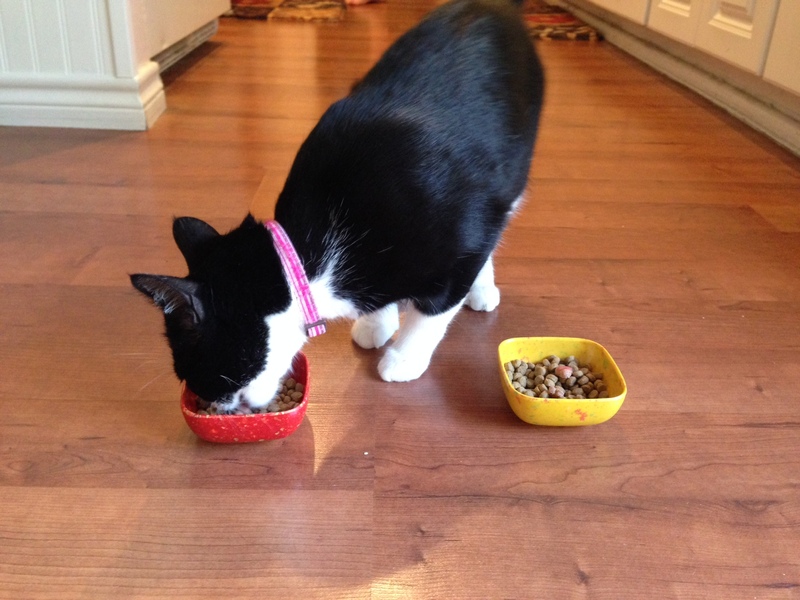 Truly one of the greatest performances we have seen on this blog. Our only real loser this week was Mack Brown (2-3), who is off to a pretty rough start in his career as a football prognosticator. Lee Corso lost his first headgear pick of the year, going with South Carolina over Mizzou. Our special guest celebrity picker, Kenny Chesney, went 5-4 on the week, bringing his lifetime record to 16-12 from three appearances on the show. Tim Tebow only went 4-1 this week, and it only took him five weeks of picking games to get one wrong. His 18-1 record has been tarnished for all time. Jennifer is getting back on track with a 10-5 week this week, and Charley the Cat also missed the headgear pick going with South Carolina. She currently stands one game behind Corso on the year. As for everyone else, check out the full slate of results below to see how your favorite (or most hated) personality did this week. Well it looks like the show is over, the picks are entered into the official record, so it must be time to review our morning on College Gameday. The show was broadcasting live from the Columbia, South Carolina for the big-ish matchup between the Missouri Tigers and the South Carolina Gamecocks. In case you didn’t hear, Kenny Chesney will be joining the show today to pick games and perform live! There was a wild crowd out today, as is the case in most SEC matchups when Gameday is in town. The sign game was a little bit weak today, but let’s dive right in. Highlights from today’s sign game included “Gary Pinkel types in comic sans”, “Maddy Mauk? Never heard of her”, “Mizzou, Hoosier Daddy?”, “Maty Mauk wears crocks with socks” (also a possible Dr. Seuss title), “Maty Mauk thinks mayonnaise is an instrument”, and the incredibly confusing “Even a bad day in the SEC is better than a good day in Mizzou”. However, this week’s winner comes courtesy of Reddit user yracuse_ and is presented without comment. After the normal crew of Lee Corso, Chris Fowler, Kirk Herbstreit and Desmond Howard opened the show, Corso was replaced by David Pollack for the rest of the first hour. We normally get 1 or 2 picks from David Pollack and the other boys during this first hour, but they were going rapid-fire this morning and Pollack managed to get in 8 picks during the first hour. Impressive stuff. 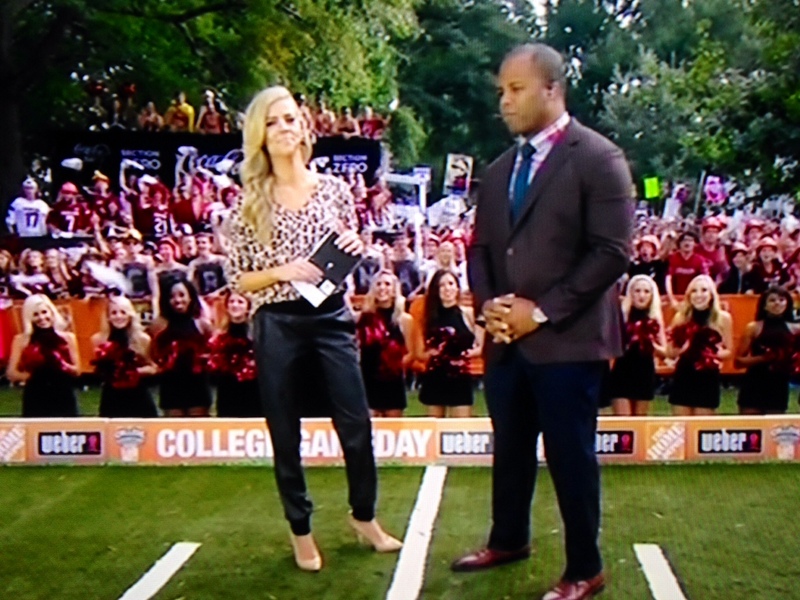 Samantha Ponder briefly joined the show to hang out with noted quarterback guru and champion of questionable outfits George Whitfield. They talked about Kenny Hill and his mechanics and vision from the pocket. In other words, the same as most other weeks. This brings us to FASHION REVIEWS with @GamedayJen. The Samantha Ponder outfit of the week is presented below. Jennifer said she loved the leopard print shirt on Ponder, but that the pants looked like leather sweatpants. I don’t know how to describe them any better. This week’s “Georgie Whitfield Mismatched Outfit of the Week” was reviewed by Jennifer as well. She said George “looks like he wants to be a hipster so bad, but he isn’t cool enough to pull it off”. Other comments from Jennifer on his outfit include “Why?” and “Don’t do it again”. Speaking of which, did you hear Kenny Chesney is going to join us later in the show to perform live and make picks? Gene W. had a piece on the Yale Bowl, as it turns 100 years old this year. Today’s matchup features Yale vs. Army, which is Yale’s first FBS opponent since the 90s. Did you know that the Yale/Army matchup today features two schools accounting for 24 national championships? This rivalry started in 1893 and ended in 1996, but it is back today. Kirk, Desmond, and David all picked Army over Yale in this one. Good segment with lots of vintage football clips featuring leather helments and gigantic hip pads. As the show moved along, we featured today’s Chef of the Day, John Hair from Jim ‘n Nicks BBQ. 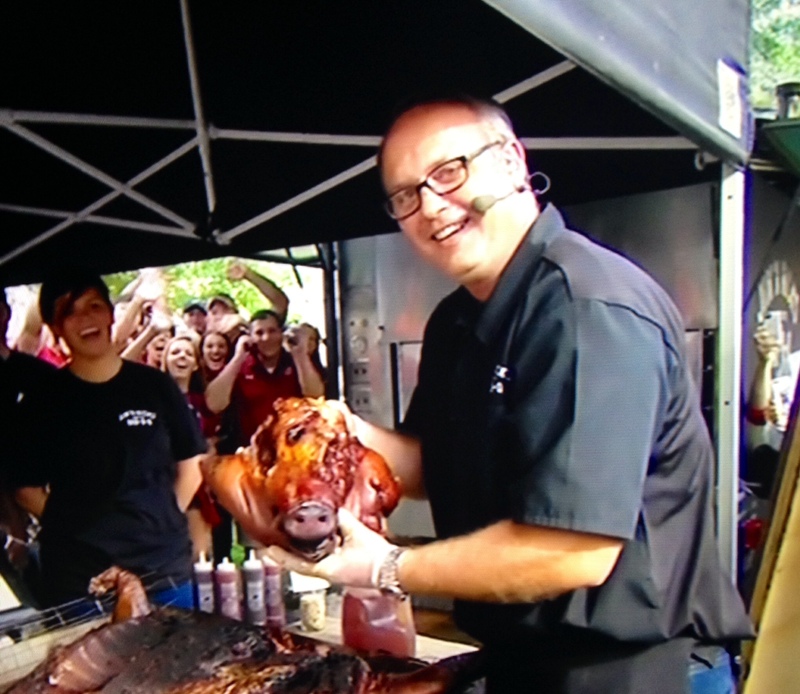 He was roasting a whole hog, and was very proud of his hog’s head. Quickly following this piece was another Gene W. piece about the current dumpster fire known as the Michigan Wolverines football program. He highlighted the fact that visiting opponents now come into the Big House and mock Desmond Howard’s famous Heisman pose after scoring. Hard hitting questions were asked such as “IS BRADY HOKE THE RIGHT MAN FOR THIS JOB?” and “HOW HOT IS BRADY HOKE’S SEAT?” My memory may be fuzzy, but I seem to recall Lloyd Carr being run out of town like a common pygmy after going 11-2 and 9-4, only to be followed by Rich Rodriguez who was run out of town for not being enough of a “Michigan Man”. I also seem to recall the rejoicing in Ann Arbor following Brady Hoke’s hiring as if humanity had achieved world piece because WE FINALLY HIRED A REAL MICHIGAN MAN!!! Oh well, I hope you enjoy whoever coaches you to a 4 win season next year. Also, in case you missed it, this week’s “Desmond Howard Michigan Pick of the Week” featured Desmond Howard picking Michigan over Minnesota by 2 touchdowns. I wish somebody ran a blog where we could track Desmond Howard’s all time record picking Michigan in games *cough* 12-12 all time *cough*. I’d like to take a moment to remind you that Kenny Chesney will be joining us later in the show to perform live and join us for picks. Perhaps the best segment of the day was the story of SEC Coach Wives. This highlighted the contributions and lifestyles of various SEC coaches’ wives and how they interact and contribute to their respective programs. Fun notes from this segment include stories of Steve Spurrier’s wife being one of the only people who went to their husband’s Heisman ceremony, Saban’s wife saying she was glad she married him at 19 because she never had to know what a normal life was like, and Les Miles meeting his wife when they were both assistant coaches in the athletic department at Michigan. Dan Mullen’s wife is known as “Mama Mullen” and she likes to go to practice to motivate the players when they are down. Mark Richt’s wife enjoys mixing the team’s Powerade before games because they need to get it just right for that day. Nick Saban made a funny, telling us of how he asked his wife “Did you ever think in your wildest dreams we would win 3 national championships?”, to which she replied “Honey, you’re not even in my wildest dreams”. Gus Malzahn’s wife told the story of how she watches all games from the privacy of her own room at the stadium. After hearing her screaming at the top of her lungs, I can’t imagine why she “chose” to enjoy the games in the privacy of her own room. She also told the story of how every Saturday night, if the team wins, she takes Gus to Waffle House for date night. If anyone wants to get a Kickstarter campaign going to launch “Real Housewives of the SEC”, let me know, because this needs to exist. The absolute best comment of this segment came from LSU head coach and noted wordsmith Les Miles, who said his wife is the “assistant coach, recruiting coordinator, and all around valued opinion”. I would like to go on the record right now that I consider my wife Jennifer to be an all around valued opinion as well. Stay tuned, because Kenny Chesney will be joining us later in the show to perform live and make picks with us! 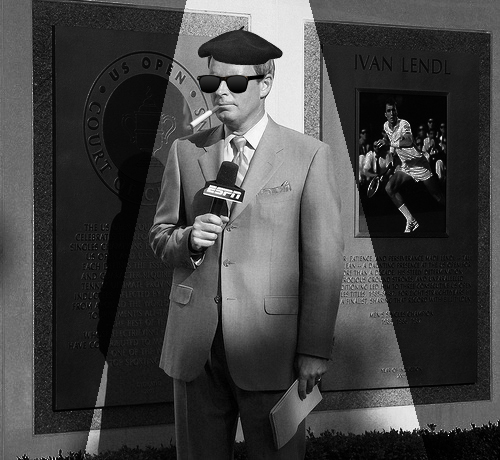 We were also riveted to see the return of “Beatnik Poetry featuring Tom Rinaldi”. This week’s piece was entitled “Underway”, and had such philosophical one-liners as “Steele… bronze… gold… here’s the prize [picture of the championship trophy]… now here’s the pain [insert video of teams losing]”. He said some more stuff, and then let us know that the season is “Underway”. This week’s overly casual roundtable segment (where they leave the desk to go sit in high chairs ten feet away and talk) featured the Gameday boys reviewing their preseason predictions. They each had a mulligan and were asked how they would change their picks today. The highlight was Corso boldly proclaiming he wouldn’t change a single thing in his predictions. Then the guys all talked over each other for a while. Don’t go anywhere, because coming up later in the show Kenny Chesney will be joining us to perform live and make picks! Tom Rinaldi had another segment featuring Mack Brown’s brother Watson Brown, who is head coach at Tennessee Tech. He is sitting at a 128-199 record, and is nearing the all-time loss record. However, he has accomplished a few good things in his time, such as building UAB from an FCS team to the FBS level, beating LSU at UAB, and never having a single NCAA infraction in his 30 years as a coach. I guess its like they say, if you’re not cheating in this sport then you’re not winning. 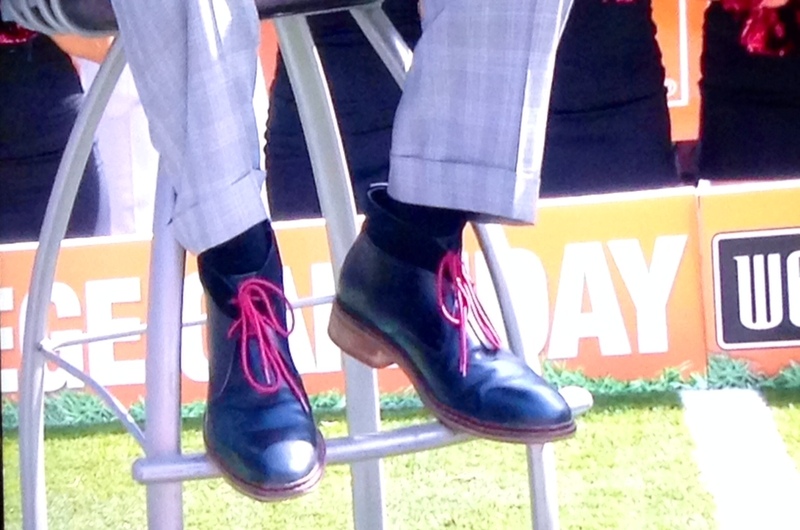 Also, Tom Rinaldi was wearing these shoes today. Let’s move on. Coming up shortly, Kenny Chesney will be joining us to perform live and make picks. Now, this week’s “Chris Fowler Hundred Dollar Question”: What FBS team has lost a fumble on each of its opening series in its last three games? The Gameday crew took this opportunity to kick the directional Michigan schools in the crotch, picking Central Michigan, Eastern Michigan, and Western Michigan. However, the answer was UConn, and the hundred dollar bill remains unclaimed. At this point something happened which you probably weren’t expecting today: Kenny Chesney joined the show to perform live to promote his new album or something! Now that the Kenny Chesney concert is over, let’s get down to the real business at hand. It is time to make some picks. David Pollack got it started early, picking Mizzou over South Carolina. Kirk agreed, and went with Mizzou. Desmond picked South Carolina. 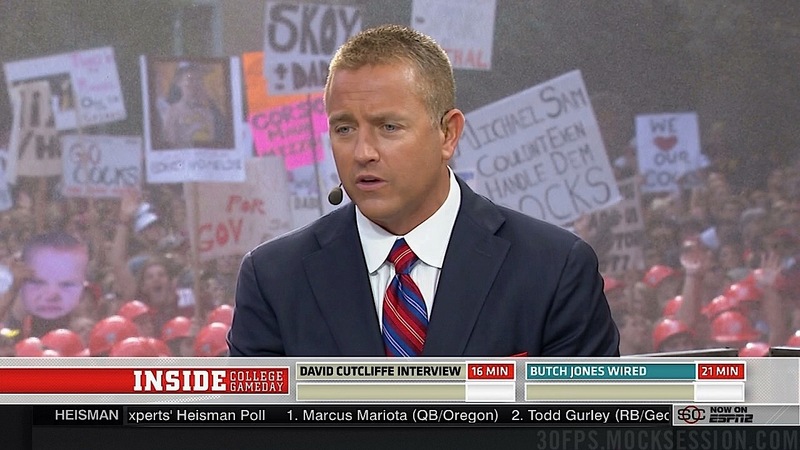 Kenny Chesney was this week’s guest picker (I wish ESPN had hyped this up a little bit more), the only three-time-picker in the history of College Gameday guests. He picked South Carolina over Mizzou as well. Lee Corso poked and prodded the crowd, replaying footage from Gameday ten years ago when he boldly proclaimed Steve Spurrier would NEVER win a national championship at South Carolina! 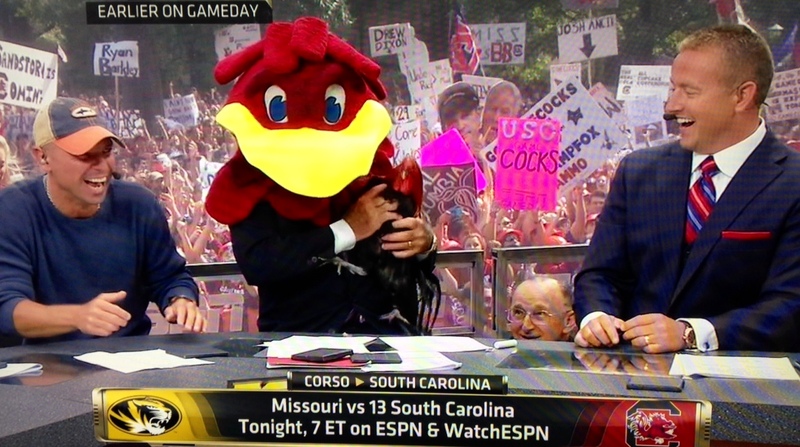 This sent the crowd into a tizzy, but ultimately Corso said they are still good enough to win the game today, as he popped on the Gamecock’s headgear and held up a live chicken. The live chicken marks this season’s first appearance of the “Kirk Herbstreit Subtle Fear of Live Animals” where he leans away cautiously every time a live animal is brought on set. Around the house here, Charley the Cat picked South Carolina as well, so Coach Corso will hold his one game lead over Charley on the year regardless of who wins. Enjoy your day and everyone have a happy football! In case you haven’t heard, it is Saturday morning, and College Gameday is COMIN’ TO YOUR CITAAAAY! That means we will have picks out the wazoo this morning. We will have the Gameday crew with Lee Corso, Kirk Herbstreit, Desmond Howard, and David Pollack. We will have a little Dari & Mel. We will have picks from the Tim Tebow Network. We will have Kenny Chesney and of course Lee Corso’s Headgear Pick, so check back often to see the latest picks from all of your favorite (or most hated) personalities!